NETWORK FINALS: The ABC FALL PREVIEW special fell 0.1 in final numbers, and the COLLEGE FOOTBALL game adjusted up 0.1 to 1.3. On CBS, BIG BROTHER gained 0.1. FOX’s COLLEGE FOOTBALL game rose 0.1 to 0.8. CABLE HIGHLIGHTS: With GAME OF THRONES out of the way, Starz aired its delayed season finale of POWER, and its 0.90 was down just a tick from the 2016 finale, and up 0.05 from its most recent episode 2 weeks ago, while lead-out SURVIVOR’S REMORSE (off the chart because Starz mistakenly listed it as a rerun) was up a tenth from last week’s POWER-less airing to 0.33/783K. On Showtime, the 2-hour finale of TWIN PEAKS was at 0.10/0.09, up a bit from last week’s 0.08. On HBO, the loss of their THRONES lead-in put BALLERS down an ugly 0.95 to 0.42, while INSECURE held comparatively better, down 0.27 to 0.39. FX’s THE STRAIN climbed 0.07 to 0.38. 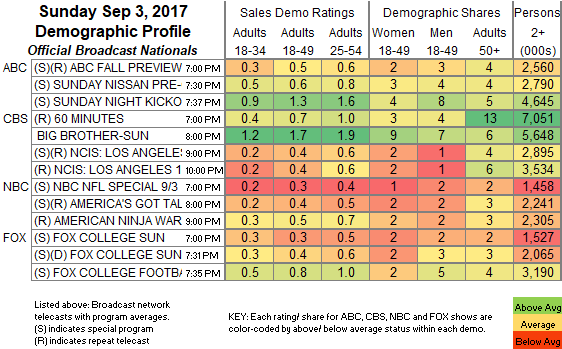 TNT’s THE LAST SHIP gained 0.03 to 0.34. Nickelodeon’s noon MYSTICONS was at 0.31. Hallmark’s CHESAPEAKE SHORES ticked up to 0.23. MTV’s TEEN WOLF returned from a week off at 0.22. TLC’s 90 DAY FIANCE led unscripted at 0.60/0.57, compared to last week’s 0.66/0.56, and SPOUSE HOUSE was up 0.07 to 0.27. NBC Sports Net’s NASCAR race was at 0.59. ESPN’s MLB SUNDAY NIGHT game was at 0.46. HGTV’s Sunday line-up was led by ISLAND HUNTERS at 0.37/0.32, compared to last week’s 0.34/0.34. 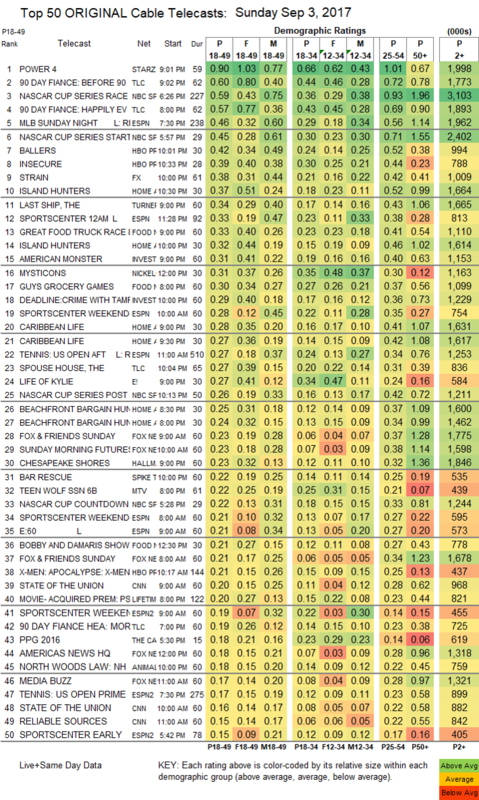 On Food Network, GREAT FOOD TRUCK RACE rose 0.03 to 0.33, and GUY’S GROCERY GAMES was steady at 0.30. ID’s AMERICAN MONSTER held at 0.31, and DEADLINE CRIME was at 0.29. ESPN’s US OPEN coverage was at 0.27. On E!, LIFE OF KYLIE dropped 0.05 to 0.27, and WAGS was down 0.02 to 0.13. Spike’s BAR RESCUE returned from its week off at 0.22.